PALMDALE – The Mojave Desert Air Quality Management District (MDAQMD) approved the inter-district transfer of offset emission reduction credits (ERCs) to the Antelope Valley Air Quality Management District (AVAQMD) for the Palmdale Power Plant at its board meeting held on Monday, Oct. 28 in Victorville. According to the California Health & Safety Code (H&S Code) §40709.6, emissions of air pollutants from a stationary source located within one air district may be offset by emissions reductions credited in another air district under certain circumstances. If the two districts are located in the same air basin then the district where the credits originate is required to determine the type and quantity of the emissions reductions credited (H&S Code §49709.6(b)) and adopt a resolution approving the transfer after taking into consideration the impact of the offset on air quality, public health and the regional economy (H&S code §40709.6(d)). The power plant was purchased by Summit Power Group LLC, a Seattle, Washington based company that develops all types of energy projects, including carbon capture projects for enhanced oil recovery, natural gas, coal, wind, solar projects and other energy-intensive industrial projects using proven technologies. The purchase of the project, which includes initial purchase price, development costs, development premium, 50 acres of land, transmission construction cost savings, and potentially additional acreage will bring the City of Palmdale $27.4 million dollars, bring in $5 million dollars annually in products and services; generate $6 million dollars a year in taxes for Los Angeles County; create up to 800 construction jobs and 35 permanent jobs; pave 4 – 6 miles of roads; and pay for a $20 million dollar reclaimed water trunk line which will connect the Lancaster and Palmdale treatment facilities. 8 comments for "Palmdale Power Plant obtains transfer emission reduction credits"
Have a look at Summit Powers Gas Powered Plant in Lake Side, Utah. Just a few years old, and about the same size as what they want the Antelope Valley to deal with. You almost have to hold your breath just to look at this. Kiss your clear blue sky goodbye. That is what the power plant would look like if it was approved by the City of Lancaster. I see some steam coming from 3 towers. what are you trying to say? Oh, Richard. Would you go ahead and look up the emissions from the Lake Side plant and post them side-by-side with what is projected for the Palmdale Power Plant? That will be more useful and accurate than just a photo. I’ll echo William here, and say that you should probably look up the actual emission ratings from the Lake Side plant, which are readily available via a quick Google search for “Lakeside Power Plant Utah emissions reports”. 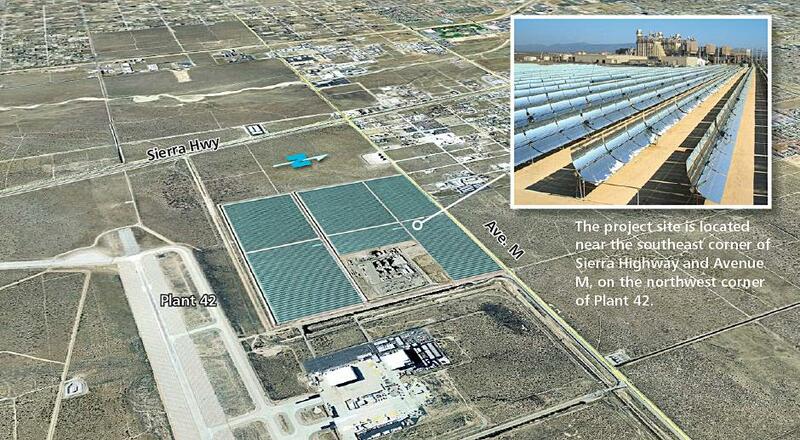 You’ll notice that the Palmdale Power Plant will be using almost identical power generation technology. I would be more worried about the increase of population and the emissions from the additional vehicles if I were in your shoes. Wow, zoom in closer and you are in the steam. Zoom out one level and we can see how little steam there really is. Zoom out to cover the entire site and we see it is very little steam. Zoom out to a city size and wow, just so much steam and so much sky blocked by it. Hmm. I guess Rex will now sue Mojave Desert Air Quality Management District. Oh, wait. It’s already a ‘district’.